CAL BEGAN ITS ONCE weekly non-stop service between the AIA and the John F Kennedy International Airport in New York on Wednesday, March 14. According to reports, this Wednesday’s CAL flight was fully subscribed, a usual occurrence since the service began. The CAL nonstop service will increase to twice-weekly beginning Saturday, July 7 and run on both Wednesdays and Saturdays, until Saturday, August 25. The Sunwing charters from Toronto to the AIA resumed this Wednesday and will continue every other Wednesday until June 20, when the frequency will increase to once weekly, ending on July 25; thereafter, flights will operate on August 8, August 22 and August 29, 2018. Sunwing also operated charters from Toronto to the AIA between December 2017 and January 14, 2018. Air Canada Rouge ended its once weekly non-stop service from Toronto to the AIA on April 12. The service, which used an A319 aircraft with seating capacity of 136, began on December 14, and had been operating with a 90 to 91 per cent load factor. 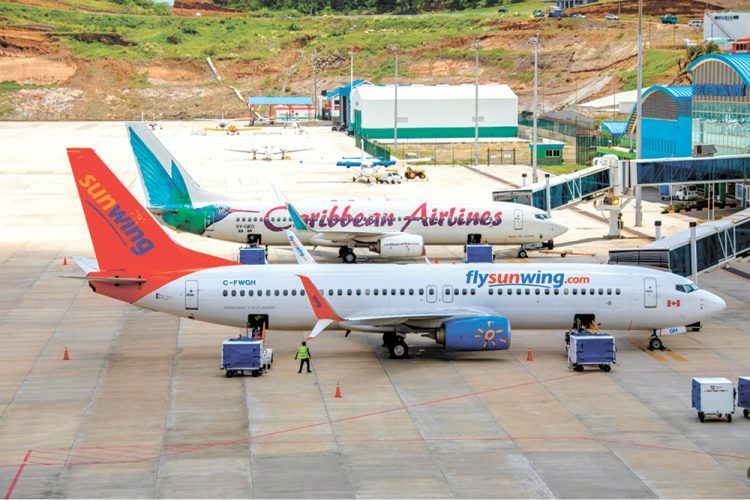 TWO BOEING 737 aircraft, operated by Caribbean Airlines (CAL) and Sunwing respectively, on the tarmac at the Argyle International Airport (AIA) on Wednesday, April 25.